Though YouTube is most commonly associated with visual content, sound-oriented videos are resonating with millions of users. Learn how some brands are raising their online profiles by lowering the volume. Alerts, notifications, pings—the sounds send an anxious shiver down our spines. But many consumers are actually using technology, especially video, as a way to relax. There's an entire universe of sound creation on YouTube designed to make you feel good. Sound a bit niche? It's not. 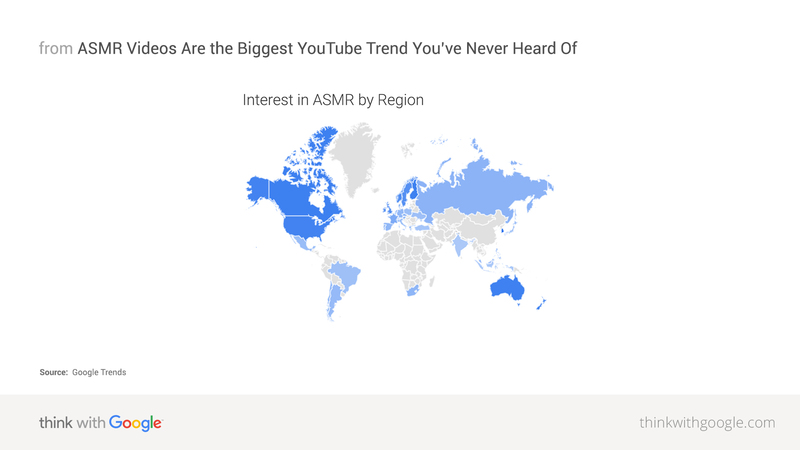 ASMR is the biggest trend you've never heard of. Coined in 2010, ASMR (autonomous sensory meridian response) is a relaxing, often sedative sensation that begins on the scalp and moves down the body. Also known as "brain massage," it's triggered by placid sights and sounds such as whispers, accents, and crackles. In 2015, BBDO created ASMR video ads in China for Dove chocolates that were designed to evoke the "tingling of silky smooth pleasure" consumers felt when eating the confections. The films were even put to scientific testing, and the results are being studied by neuroscientists. Regardless of how ASMR works, there is clearly a huge, engaged, and growing audience that responds to it. And as a brand, you don't have to "get it" to benefit from it. You just have to engage this unique and largely untapped community in any number of creative ways. Now how does that sound? 1 Google Trends, Worldwide, Jan. 2008–Aug. 2016. 2 Google Internal Data, Aug. 2015–Aug. 2016. 3 Google Internal Data, 2015 vs. 2016. 4 Google Internal Data, Apr. 2015–Apr. 2016. 7,8 Google Internal Data, as of Aug. 19, 2016. Google­defined lifestyle, psychographic, and behavioral audiences based on anonymized, aggregated user browsing behavior on the Google Display Network. Audience defined as U.S., interested in ASMR, as compared to the U.S. general population.